The word “Sudan” is often enough to ward off visitors, who are relatively scarce in numbers, to a country whose name conjures up such a scary image. Yet, who does travel here, will surely experience one of the greatest journeys of their lives, and with reason. Prior to 2011, Sudan was the largest country in Africa but after the separation of Sudan and South Sudan, the country has lost substantial land area, becoming the third largest country on the continent. For average divers, Sudan is a relatively unknown and not a very popular destination. Sadly the media mostly focuses on the tumult between the two countries, and rarely highlights the beauty of the country, the lives of its people, and all it has to offer. Perhaps, when it comes to Sudan’s sights, the best known fact may be that it has more pyramids than Egypt, though fewer have been excavated. When it comes to divers, Sudan is one of those destinations where you simply must dive, if only once in your lifetime. The marine life beneath the Sudanese Red Sea blows away even the most travelled and experienced divers! 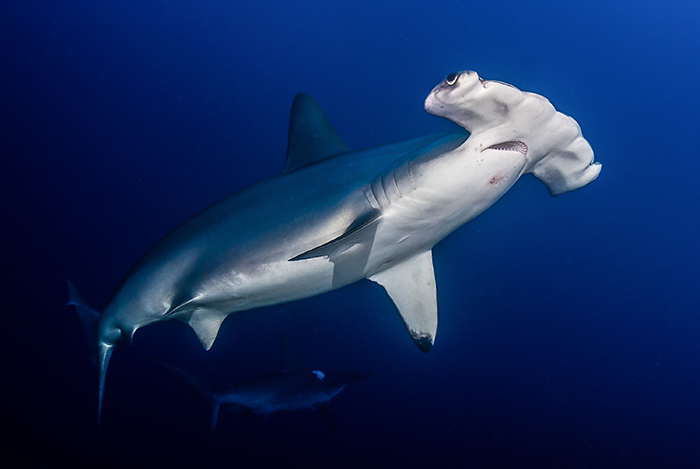 These waters amaze even hammerhead, reef shark, barracuda, and wreck lovers. Anyone who has dived in Sudan, never left disappointed. This is an awesome dive spot in the lesser known areas of the Red Sea. While in Egypt hundreds of dive boats coast the waters, this number in Sudan is close to only ten. This in turn promises sailing when for days there would be no other boats in sight. Diving season: From February until May. The weather is still cooler and windy until February, and by the end of May both air and water temperatures become too hot for man and animal, and most of the large fish migrate to the south. Wrecks: Umbria, Precontinent II (Conshelf, scooter hangar, multi-level cylinder-shaped station, deep cabin at 30m, and at 10m, a starfish-shaped house). Routes: Classic North, North, Ultimate Sudan, South, 1-week Deep South, 2-week Deep South. Most famous dive sites: Shaab Rumi, Shaab Rumi south plateau, wreck of Umbria, Sanganeb, Shaab Jibna, Shaab Ambar. Travelling there: From your country of residence – via Dubai – to Port Sudan. Sudanese visa: May be arranged at the Sudanese Embassy or Consulate in your country of residence, or through our office in Port Sudan. To divers who have not been to Sudan before, first we recommend the North route and the Ultimate tour the second time around. The Deep South route is recommended for divers who have been returning to Sudan regularly, who are experienced, and who are ready for a genuine underwater adventure. Now let us talk about the itineraries in more detail! What makes this tour interesting is that with relatively little sailing time, you are able to enjoy some of the grandest dive spots in the Red Sea. A good example is Shaab Rumi where you can spend several days exploring the reef. 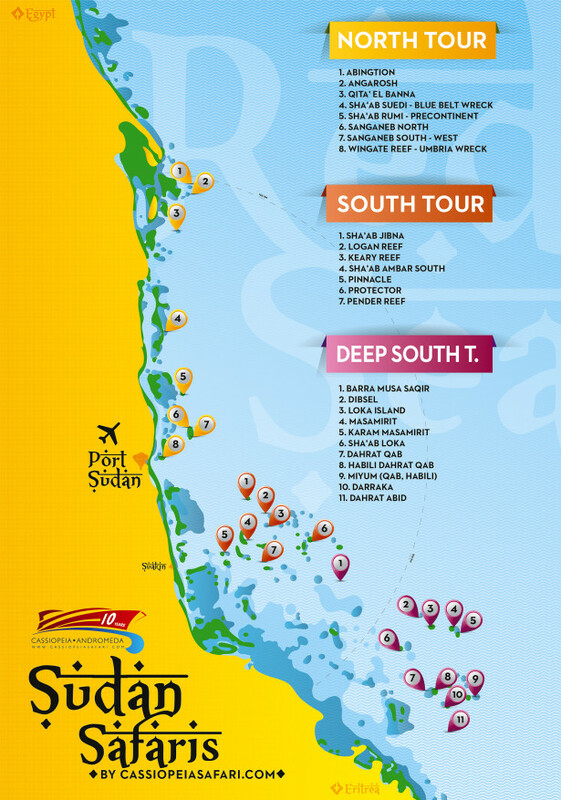 This is a perfect route for those who are visiting the Sudanese Red Sea for the first time. The beautiful lagoon, surrounded by the reef, can be accessed through a narrow passageway that Cousteau himself blew into the reef. Outside of the lagoon is Cousteau’s famous underwater world, the Precontinent II, that is a testament to how man is capable of living under the water. The land strip stretching into the open sea at the southernmost point of Shaab Rumi promises an exciting dive with its steep drop-offs and amazing species of fish such as grey reef sharks, hammerhead sharks, barracuda, tuna, batfish, and coral groupers. This special route is offered by only a handful of liveaboards, so it is a favourite among divers who prefer to dive away from the crowds. This peaceful “neighbourhood” is also home to most of the sharks in these parts. This itinerary covers a large area and includes excellent dive sites all the way as far north as Angarosh or Abington. Hundreds of barracuda swarm amongst the brilliant cherry- and purple-coloured gorgonians (sea whip corals) alongside of a colourful array of fish, and of course, hammerheads. One of the sites on this route is Umbria, the wreck of an Italian cargo ship that lies at 25 metres on the sea floor, still laden with close to 18 tons of ammunition and explosives. She is home to schools of barracuda, spiny fish species, butterflyfish, and myriads of red tropical coral fish. This itinerary promises and delivers an utterly perfect experience with the exciting combination of dive sites from the northern and southern parts. 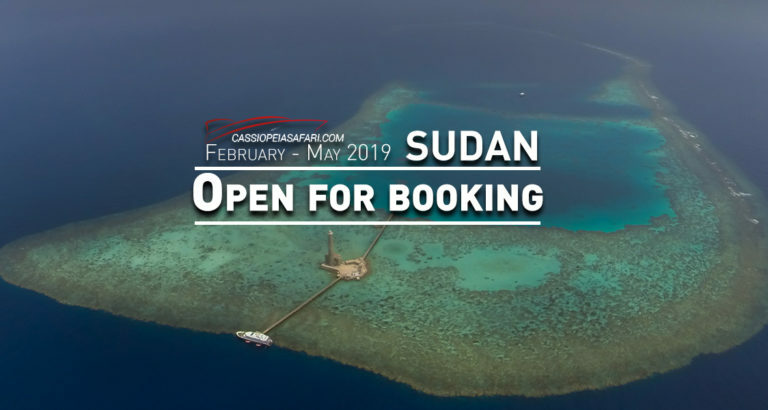 This is the perfect route for those who have not dived in Sudan before because they can sample the best of both regions. Sanganeb, Sudan’s first national park, boasts an abundant marine life that includes over 120 coral species. Shaab Jibna (sometimes spelled Jumna) is a quaint dive site with caves and reef walls where fish dart through the crevices with hammerhead sharks cruising nearby. 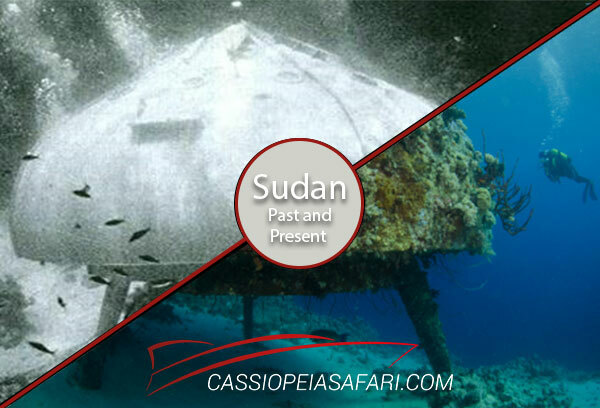 Cousteau conducted his underwater experiments at Shaab Rumi which is a shallow reef with steep walls. It promises an exciting adventure of discovering the tools and buildings that were left behind and still offer a glimpse into the lives of men living here decades ago. Shaab Rumi is especially famous for its various shark species, and this is the best place to meet up with hammerhead sharks during the spring season. 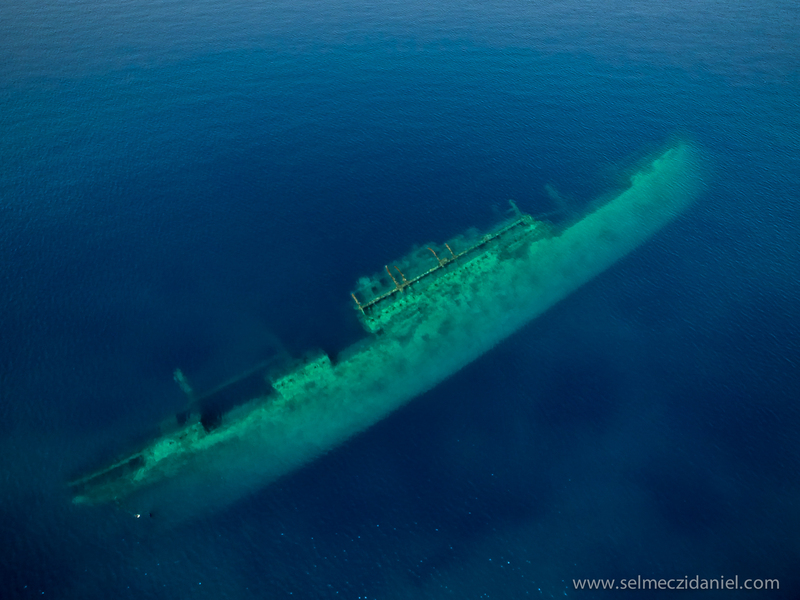 The wreck of Umbria is protected by Wingate Reef. The Italian cargo ship is over 150m long and she is still harbouring her military cargo (bombs, ammunition, detonators) from WWII. While near Port Sudan and learning of Italy having officially declared war, she was scuttled by her own crew to prevent the precious cargo getting into the hands of the British. This itinerary is for advanced divers who are up for a challenge. We visit the best of the southern sites, promising an unforgettable experience. Most islands and reefs are actually peaks of deep underwater structures that provide a perfect location for various species of sharks, tuna, and barracuda. 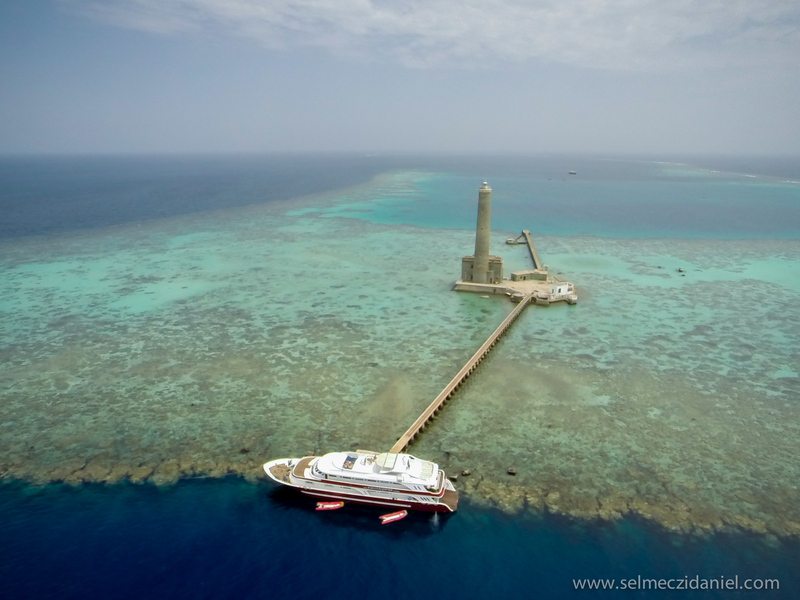 Shaab Jibna, Shaab Ambar, Keary Reef and Protector Reef entice with spectacular dives. We recommend this route to divers who have been to Sudan before and would like to see even more of her, as well as to those advanced and experienced divers who would like to be part of a true adventure. During this very unique tour we sail southward all the way to Dahrait Abid, close to the Eritrean border, and we visit sites like Masamirit, Barra Mussa, the reefs of Keary, Pender, Logan and Protector, Shaab Ambar, and Umbria, among the many. The pristine waters and the mostly undiscovered sites hide a wondrous marine life and astounding shark sightings. Only a couple of liveaboards dare to attempt to sail this route, making this a truly one-of-a-kind diving trip. We only recommend it to advanced divers. Diving in the Sudanese Red Sea is an experience that promises wonderful coral reefs, giant balls of colourful tropical fish, and an unparalleled variety of shark, fish and manta species that take diving to the next level. Man also played an important role in elevating Sudan to be a divers’ Paradise. Numerous wreckages lie beneath the sea, Umbria being one of them, the world-famous and awe-inspiring wreck. Shaab Rumi has been sheltering for decades the remnants of Precontinent II (including the favourite Conshelf), the ambitious underwater experiment of Cousteau’s. In 1963 he and his team conducted experiments on whether it was possible for man to live underwater for extended periods of time. You can learn some more about this in one of our earlier articles. We look forward to hearing from you if you have any questions or you are ready to come onboard. Write to us at info@cassiopeiasafari.com!